The Cubs inability to get runs across the plate has led to an ugly stretch of baseball, scoring three or fewer runs in seven of the last eight games…All seven of those being L’s. At 6 games below .500 and sinking the devoted Cubbie fan base is up in arms, and who can blame them. Suggestions from the Cubs blogosphere on what will help this team get back on track include the expected, like benching A-Ram and Lee, 86’ing Lou and Hendry, fire sale the roster and start over next year…To the less conventional suggestions like returning to the College of Coaches, in-game tasering of Lou, sending A-Ram to Joe Mauer’s dad’s garage to hit off that PVC pipe & coffee can contraption, and the always stimulating – team enema. A few more hits with runners in scoring position might be easier and just as effective as any of those suggestions. 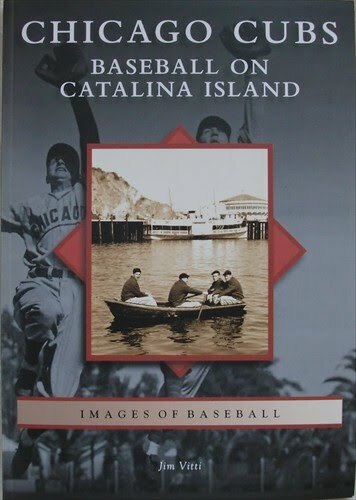 If the Cubs play of late has left you a bit apathetic about the 2010 squad you can get a fun and interesting Cubs fix with Jim Vitti’s new book, Chicago Cubs – Baseball on Catalina Island. The book is a condensed paperback edition of his marvelous hardcover tabletop book, The Cubs on Catalina. From 1921 to 1951 the Chicago Cubs held spring training off the coast of Southern California on Catalina Island. Dancing and dating starlets, hunting wild boar, deep sea fishing, card and dice games, the stories are all here, oh yeah, they played some baseball as well. Jim Vitti gives you the low-down of our boys of spring and their island adventures in his own humorous and observant writing style. With over 225 awesome vintage Cubs images and photos this is a must have for your collection. You can order the book at Arcadia Publishing. Many Questions, do the Cubs have Answers?